So, for day 1, am here with some delicious gravy curry, Aloo Kurma. Yes, you read it right, aloo kurma without onion and garlic. No kurma or gravy curry is made without onion. 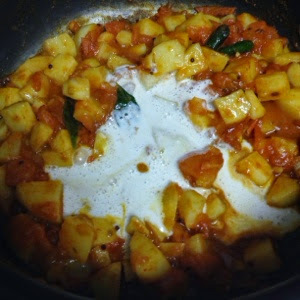 But this version of aloo kurma has a special taste which comes from tomato and cashew paste. Add some kasuri methi at the end of the cooking process to give a extra flavor to the gravy. I did not add in this recipe as I was out of it. This gravy/ kurma tastes good with roti, chapatti or naan. Soak cashew nuts in little water for 10 minutes. Chop tomatoes into medium size pieces. Peel skin of potatoes, cut them into medium size pieces and drop them a bowl of water so that they do not turn black. Heat presser cooker and add oil. Once the oil is hot add cumin seeds, mustard seeds, curry leaves and chana dal. Let them fry for a minute and add curry leaves and chopped tomato. Cook till tomatoes turn little soft. 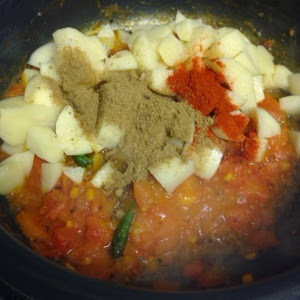 Now add potato pieces, salt, haldi, chili powder and coriander powder. Mix well and let it cook for a minute. Now make a smooth paste with cashew nuts along with the water. Add this to potatoes and mix well. Add 1/2 glass water and presser cook till u hear 1 whistle. Wait for 5 minutes till all the presser is gone. Now open the lid and give it a stir. 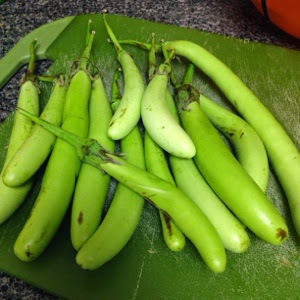 Add chopped cilantro and serve hot with roti's, naan or even with pulao. Check to see what my Fellow bloggers are cooking for BM# 46. The gravy looks rich with the cashew paste. Nice pictures. Aloo kurma is all time favorite!..good one to try for a no onion garlic times.. Excellent side dish for rotis, i can have two more rotis with this dish. 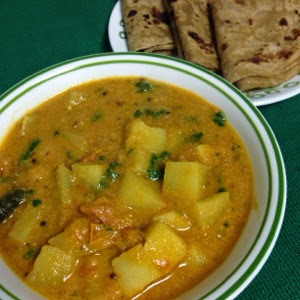 A delicious and tasty aloo kurma. such an aromatic and mouthwatering korma there :) looks yumm dear !! Aloo kurma without onion and garlic is hard to believe, but your curry looks inviting and delicious. Lovely choice to be made into a non onion dish. Looks very good!